You can load an arbitrary number of datasets and choose the labels to compare. Filters and powerful visualization enables to keep track of calibration progress and dataset variants. This manual contains information concerning specifically the SGE CompareArtist only. The SGE CompareArtist is part of the SGE Circus. For help topics regarding general features please refer to the corresponding documentation accessible using the links below. Paste dataset files from clipboard into present session. The main features of the SGE CompareArtist are listed in this introduction. For details please see the following sections. 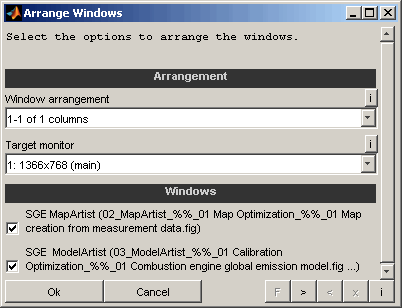 Calibration data to be managed using the CompareArtist must be stored in calibration data files (e.g. DCM, PaCo, CDFX, MeCal or others) or handled inside ETAS INCA software. Any number of datasets can be loaded simultaneously. Exactly one dataset will be the master dataset. Its values will be the reference to compare all other dataset to. 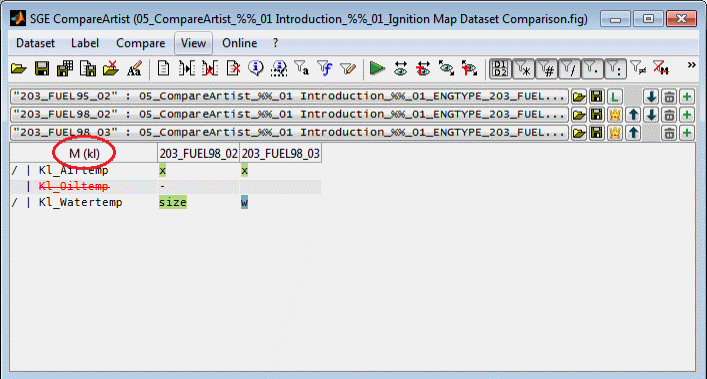 To load a dataset into the CompareArtist use the “+” buttons at the right border of the main window or the corresponding menu item. A dataset will always be added below the dataset placed in the line of the used “+” button. Multiple files can be loaded at once. When you add, remove or reorder datasets the labels to compare will be updated automatically only when you selected “All master labels”, “All labels from active datasets” or “All labels from all datasets”. To reload or replace a dataset press the button with the “open folder” sign right to the dataset name. 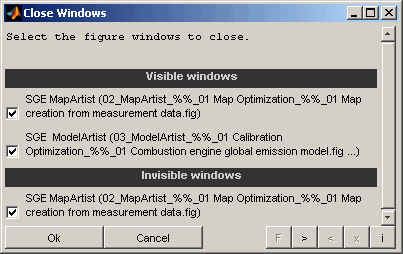 A dataset can be loaded either from a calibration data file (e.g. DCM, PaCO, CDFX, MeCal or others) or from a running ETAS INCA software. It is also possible to load session files. The file(s) to load the dataset from will be asked. When adding new datasets multiple files can be selected at once. When replacing a dataset only one file can be selected. Various file formats are supported – e.g. DCM, CDFX, PaCo, MeCal and BMW Race Calibration. It is also possible to load session files using this dialog. When loading datasets from ETAS INCA software you will be asked to select the project and dataset(s) from a tree view showing the actual INCA database. An optional short name for the dataset will be asked if a single dataset was loaded. A short name is a convenient way to identify datasets in the main view and visualization windows for datasets with long file names. In case of loading multiple datasets at once the short names will be applied automatically. 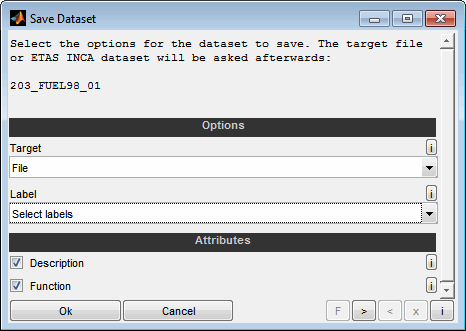 The dataset short names can be modified after loading the datasets using the corresponding menu item (F2). No data will be loaded from the selected files or INCA at this point of time. Data will be loaded on demand when a comparison is run. In case of a file modification during a CompareArtist session or when reloading a session it will be detected and the data will be reloaded from file. This is only true for datasets loaded from file. Changes to datasets retrieved from ETAS INCA software will not be detected. Missing files will be ignored as long as no data has to be loaded to enable working with session even if files are missing. In addition to using the file load dialog, you can load datasets and sessions from file by using drag and drop or the clipboard. To do this, one or more files can be dragged directly to the CompareArtist session or inserted via keyboard shortcut (Shift + v). It is also possible to copy files directly to the clipboard as well as strings containing the file names line by line. Datasets can also be saved. The datasets are either saved partially or completely into a calibration parameter file, a MATLAB script or transferred to ETAS INCA software. There are basically two modes available for saving. "Save all datasets" (Ctrl + s) allows you to save several or all records at the same time. The target remains unchanged. Records loaded from a file are therefore saved into the same file. Datasets that have been transferred from ETAS INCA are transferred there again. There is no query of files or INCA records - the targets are overwritten. 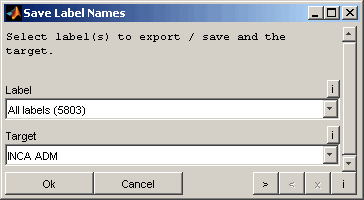 When saving a single data set using the button right from the data set button, the destination can be selected. 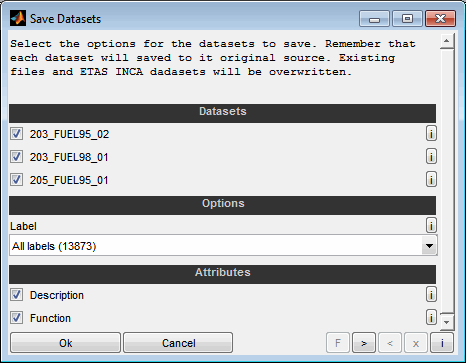 You can switch between file and ETAS INCA and the specific file or the INCA dataset is queried. Correspondingly, different options are queried for both cases. Select the datasets to save. This options is only present when “saving all datasets”. Select whether to save the dataset to a calibration parameter file (*.dcm, *.cdfx, *.dcmat, MATLAB script and others) or to transfer it to ETAS INCA software. This options is only present when “saving a single datasets”. In this case the target will or the ETAS INCA dataset will be asked afterwards similar to the dataset loading process. Otherwise there is no query of files or INCA records - the targets are overwritten. Select the labels to save. You can select whether to copy all labels, the labels of the comparison result table, the highlighted labels or the selected labels from the comparison result table only. Additionally the labels can be selected manually. When saving a dataset with a reduced choice of labels the resulting dataset files will not be complete any more. For this reason, warnings will be displayed that point out this and offer the possibility to choose between replace and update. 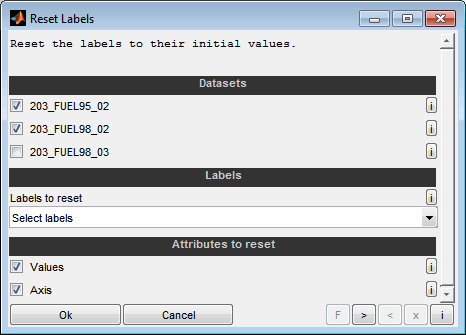 While replace creates a reduced dataset containing only the selected labels, update adds the labels to the existing dataset and updates existing labels. Select whether to save attributes like the textual description and the function of the labels. If a single dataset is saved, it can be saved as a MATLAB script (*.m). 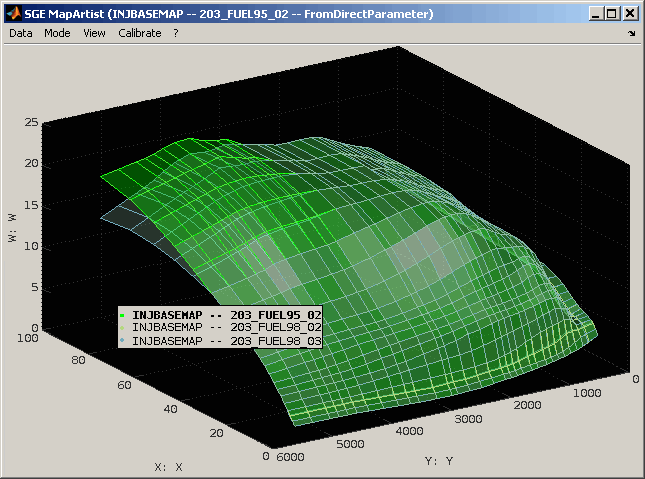 When this script is executed in MATLAB, the parameters of the dataset are created in MATLAB workspace and are available for calculations and simulation in MATLAB and Simulink. 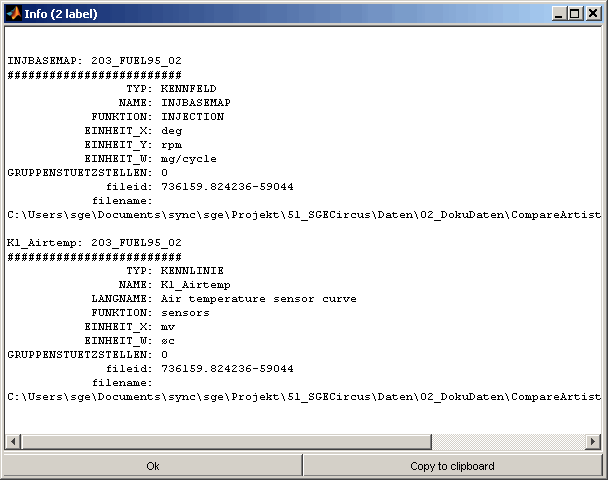 Decide whether you want to set the storage class for the created parameters to ExportedGlobal. To create a clear initial state all datasets can be removed at once. The files the datasets were loaded from are remembered. 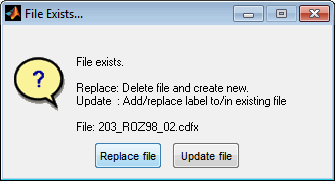 It may happen that files have been renamed or moved during the work or after reloading a session. Use the “Check files” option in this case to search the missing files and update their names and path automatically. Remember that sometimes it is not possible to find missing files. Datasets corresponding to missing files can be removed from the comparison. The option “Continue + Remember” in case of a successful search allows you to save search results and apply them quickly next time without prompting. 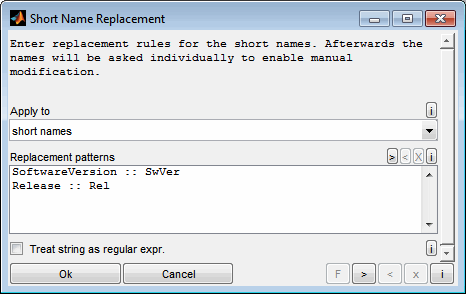 To reset these saved replacements, the software must be restarted or the corresponding option must be used when the message after automatic replacement is displayed. Each datasets is listed in one line at the upper section of the main window. The upper most dataset is always the master dataset. To modify the order of the datasets use the “arrow” buttons right of the dataset names or just drag the dataset buttons using the right mouse button. Use the “crown” button to make a dataset the master regardless of its actual position in the list. To remove a dataset from the comparison use the “trash bin” button. Datasets loaded can be active or inactive. Only active datasets take part in the comparison result. Datasets are active by default. To deactivate a dataset press the button containing the dataset name. Buttons of inactive dataset are displayed sunken and with a faded out dataset name. Short names describe each dataset and are used to identify the datasets in the comparison result table and other views. Edit the short names to ensure a meaningful and unique description. The dataset short names can be edited even after loading the datasets (F2) in a two step procedure. In the first step you will be asked for replacement patterns. Decide whether to apply the rules to the dataset source or the actual short names. These replacement rules are applied to all datasets and are useful to do common renaming tasks. The replacement patterns are given one rule per line. The string to look for and the replacement are separated by two colons, like "SoftwareVersion :: SwVer". The replacement is case sensitive and done in the order of lines from top to bottom. If the corresponding check box is set the strings are interpreted as regular expression. In the second step you will asked for each short name individually to modify. After the editing was done a message will inform about the short name modification and allows to undo the changes. A dataset contains of one or more label(s). The labels to compare must be chosen (Ctrl + l). Different modes are available and it can be chosen if of all data from the datasets is loaded or only the labels to compare. All labels contained in the master dataset will be considered for the comparison. All labels from all datasets will be considered for the comparison. Labels not contained in the master will be marked as missing. As a comparison is always done to the master no comparison is done for missing labels. All labels from the active datasets will be considered for the comparison. Labels not contained in the master will be marked as missing. As a comparison is always done to the master no comparison is done for missing labels. 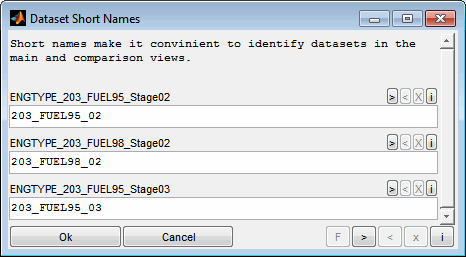 A dialog to select from the master dataset labels will be presented. A dialog to select from all labels of all datasets will be presented. Labels not contained in the master will be marked as missing. As a comparison is always done to the master no comparison is done for missing labels. A dialog to select from all functions will be presented. When selecting the label according to its functions, it is important to consider how the label functions are determined. For this purpose, the functions of the labels are first determined in the master dataset. Only if no function can be found in the master dataset, the other datasets are considered. If the functions of the labels were determined in this way, they are then applied independently of the dataset. If, for example, a label has a function in the master dataset and different function in another dataset, the label is assigned exclusively to the function of the master dataset. Make sure to first load the datasets to enable the function detection. Label list files (*.lab) will be asked to read the labels to compare from. The file should contain one label name per line. Comments may be appended if they are separated by colon or space. If a [Label] section is defined only labels from this section will be read. It is possible to read from multiple files at once. Label data files (*.dcm/*.paco/*.cdfx and others) will be asked to read the labels to compare from. Reading from these data files does only read the label names and not the data. It is possible to read from multiple files at once. The clipboard content may be used to define the labels to compare. The clipboard should contain one label name per line. Comments may be appended if they are separated by colon or space. Choose whether to load all labels from the datasets or only the labels to compare. If this option is selected all labels from the datasets will be loaded and maintained. Therefore adding labels to compare may be done without accessing the data source again. This is useful when working with sessions or datasets loaded from INCA where the data source may not be present any more. If you intend to save entire datasets from the CompareArtist you need to check this option to have all labels data present for saving. Otherwise the saved datasets will not be complete. Keep in mind that handling all data increases the session file size. When you add, remove or reorder datasets the labels to compare will be updated automatically only when you selected “All master labels”, “All labels from active datasets” or “All labels from all datasets”. After selecting labels you will be asked whether to add them to the current labels or to replace them or to remove from them. The loaded labels replace the current ones. The loaded labels are added to the current ones. Duplicates will be removed automatically. The loaded labels are removed from the current ones. Labels not found will be ignored. Additionally it is possible to quickly remove the selected labels from the comparison view (Delete). 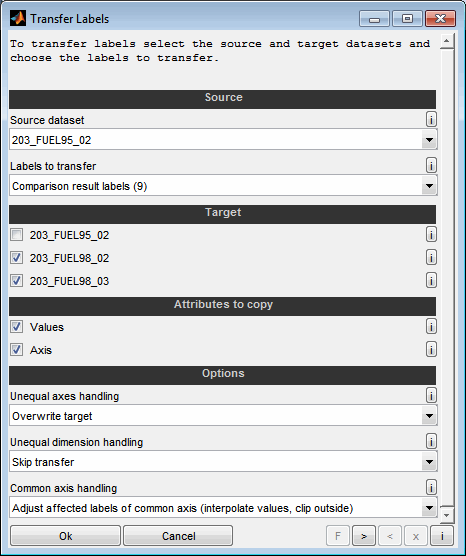 By means of a transfer (F3), labels can be transferred between the datasets and thus the datasets can be changed. It is possible to add new labels as well as overwrite existing ones. Select the source data set from which the labels to be transferred should originate. Select the labels to transfer. You can select whether to copy all labels, the labels of the comparison result table, the highlighted labels or the selected labels from the comparison result table only. Additionally the labels can be selected manually. Select the datasets to be a target of the transfer. When selected, the labels are transferred from the source dataset to this dataset. Existing labels are overwritten, new ones added if nothing else is specified using the options below. Select whether to transfer the values and or the axis of the labels. In case the size of the label in the source and target dataset does not match the proceeding depends on the next setting. Unless some interpolation is used the transfer will fail when deselecting any of these attributes from transfer. The label to be transferred is skipped and remains unchanged in the target data set. The label to be transferred is overwritten in the target data set. It then corresponds to the source dataset of axes and values. Depending on the selected direction, the label in the target is created either by interpolating the values of the source to the targets axes or by interpolating the values of the target to the sources axes. Depending on the attributes selected for the transfer, only certain modes are allowed. For example, the axis must be selected as an attribute for interpolation from source to target. If the interpolation direction is reversed, the values must be selected as attributes. You can decide whether the last value outside of the axis is to be clipped or extrapolated. The label to be transferred is overwritten in the target data set. It then corresponds to the source dataset of and values. All affected labels in the target data set are adapted to the new axis. The values are interpolated accordingly. You can decide whether the last value outside of the axis is to be clipped or extrapolated. All affected labels in the target data set are adapted to the new axis. However the values are not changed. This option does only apply if the dimension of the source and target axis are the same. All other affected labels in the target data set are not changed. The label itself will be transferred. The label to be transferred is skipped and remains unchanged in the target data set as well as all other affected labels in the target dataset. After the transfer a summary of the actions taken will be displayed and provides the possibility to undo the changes. By resetting labels (Ctrl + F3) they will be set to their initial values after loading them into the CompareArtist. This can be useful for example to undo changes resulting from a label transfer between datasets. Select the dataset to reset labels from. Select the labels to reset. You can select whether to copy all labels, the labels of the comparison result table, the highlighted labels or the selected labels from the comparison result table only. Additionally the labels can be selected manually. Select whether to reset the values and/or the axes of the labels. In case the size of the label and its initial values to not match, the values and axis attribute must be selected to perform the reset - otherwise the label will be skipped. 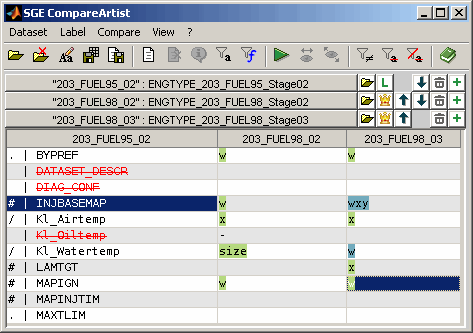 After running a comparison it is possible to show the information available for one or multiple marked labels (Ctrl + i). When clicking onto a label and hovering the mouse afterwards a tool tip will be shown containing information for this label including the ranges of values and axes, its size and some descriptive information. Also the maximum difference to master labels values is shown if available and their size does agree. To determine all labels sharing common axes the axes info is available. 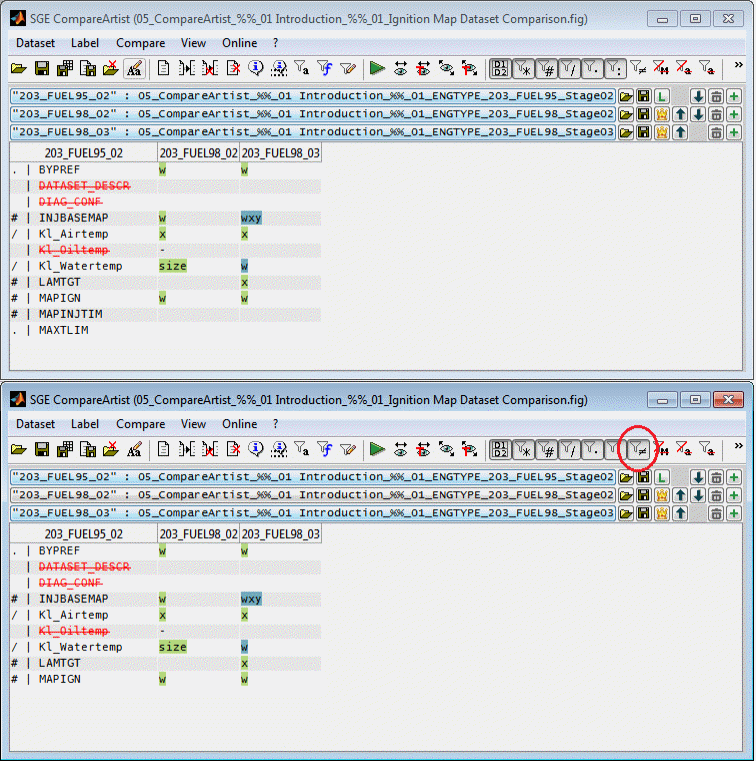 Labels can be highlighted (Ctrl + h) which means that they are emphasized in the comparison result table and their names are remembered even if they are not present in the comparison result table e.g. due to an active filter. Highlighting can be used to collect a set of labels for later usage. For example highlighted labels may be copied to clipboard or saved / exported. When highlighted labels are not contained in the comparison result table you will be warned when they get involved for e.g. copying or saving purposes. Sometimes a comparison of labels is required whose names do not match. While this can be done using “Visualize all (cross comparison)” there is another option to realize this comparison that is much more comfortable for a high number of labels. 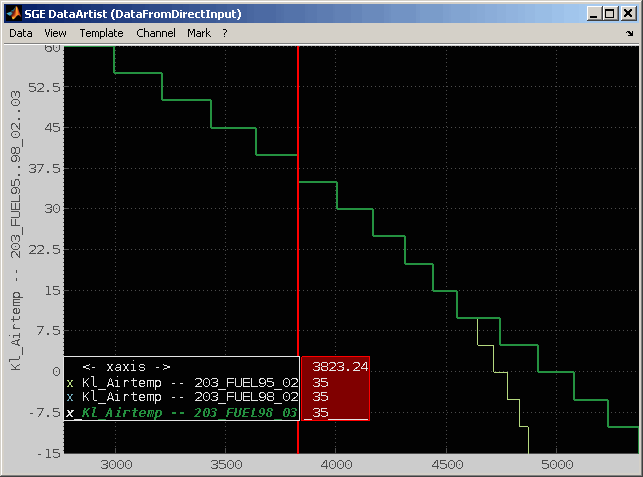 A good example is an engine with two banks and therefore two ECUs with separate datasets. Lets imagine an bank identifier is appended to the names of the labels of both banks – _B1 for bank 1 and _B2 for bank 2. By renaming the label names (Ctrl + F2) to remove the bank identifiers we get the same label names for both banks which enables a comfortable comparison. 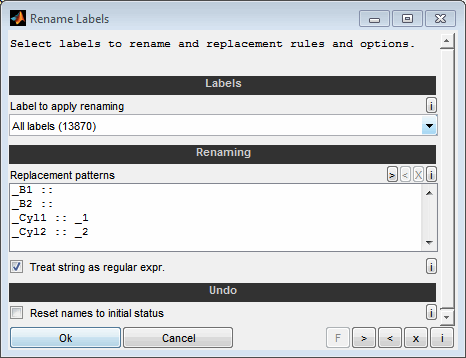 You can rename label names or using replacement patterns (Ctrl + F2). The new names must be unique for the single datasets. Otherwise they will be skipped while renaming. When renaming the label names the replacement patterns must be given one rule per line. The string to look for and the replacement are separated by two colons, like "EngineSpeed :: RPM". The replacement is case sensitive and done in the order of lines from top to bottom. If the corresponding check box is set the strings are interpreted as regular expression. After the editing was done a message will inform about the label name modification and allows to undo the changes. You can also undo the renaming and change the labels to their initial names. In this way it is possible to temporarily adjust the label names of e.g. the banks or ECUs, for example, and bring them back to their original state after processing. Label names can be saved to a *.lab-file or can be transferred to the ETAS INCA ADM. You can select whether to copy all labels, the labels of the comparison result table, the highlighted labels or the selected labels from the comparison result table only. Additionally the labels can be selected manually. 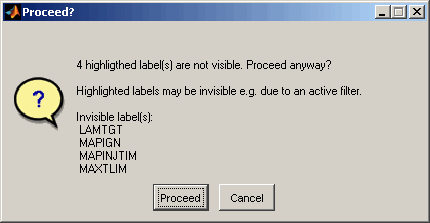 To transfer label names to the ETAS INCA ADM some conditions must be met. INCA and the ADM must a started and a proper source dataset must be inserted that contains the labels to transfer. As it is not possible to check the transfer result automatically the user must check manually that the label names were transferred successfully. The Monitor window of the ETAS INCA software may contain useful information regarding the transfer success. Label names can be copied to clipboard (Ctrl + c). You can select whether to copy all labels, the labels of the comparison result table, the highlighted labels or the selected labels from the comparison result table only. Additionally the labels can be selected manually. Label names can be visualized as a list. You can select whether to show all labels, the labels of the comparison result table, the highlighted labels or the selected labels from the comparison result table only. Additionally the labels can be selected manually. The comparison detects differences between the labels of the different datasets. The comparison tolerance can be specified to ignore small differences e.g. resulting from decimal numbers. Choose the corresponding menu item to select the desired tolerance. 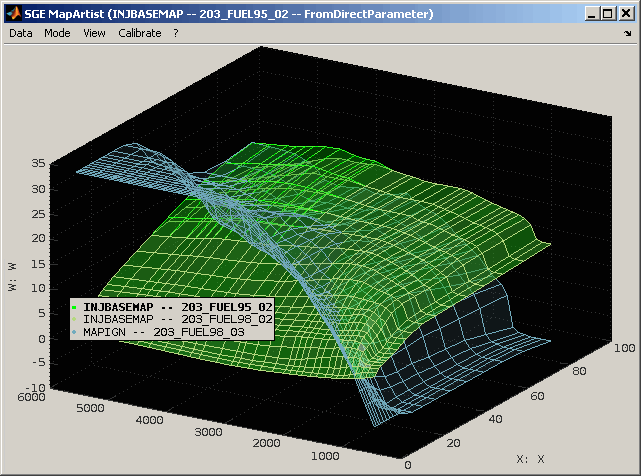 After running a comparison (Ctrl + r) a typical view looks like in the following figure. The top section contains the list of loaded datasets, their short names (if any) and the buttons to arrange and delete the datasets. The visibility of this section can be turned off (F6) to maximize the bottom section area. The bottom section contains the table with the compare result. Each column represents one dataset. The fist column lists the label names for the master dataset. If it is selected to show only diffs (Ctrl + d) the list will only contain labels that differ to the master for at least one dataset. The remaining columns display the compare result for one dataset each. Signs are used to indicate the type of difference (e.g. axes, values, size). The following table gives a overview of the denotation of the signs and entries in the table. Multiple signs may be combined in one table cell. If a label is missing in the master dataset the label name is struck out and colored red. As a comparison is always done to the master no comparison is done for missing labels. The label is missing in the compared dataset. The size or type of the label differs compared to the master. The x axis values differ compared to the master. The y axis values differ compared to the master. The values differ compared to the master. Background colors are used to group datasets that are equal for a label but differ from the master. Therefore it is easy to identify common differences. 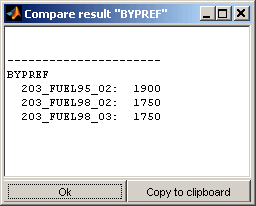 The view of the compare result can be adapted by using filters. These can be configured using a dialog available from the corresponding menu item or a keyboard shortcut (Ctrl + f). Set a label filter based on their name. Enter the label name to reduce the view to. The wildcard * can be used to match any characters. If the filter string starts with a / the expression will be evaluated as a regular expression. Alternatively you can just type in the filter expression using upper case letters regardless of the case of the function. The active filter will be displayed in the table header of the master dataset. Set a label filter based on their function. Alternatively you can just type in the filter expression using upper case letters regardless of the case of the function. No wildcards must be used. The active filter will be displayed in the table header of the master dataset. As long as the filter oes not match any function it is colored red. Otherwise it is colored green. Choose which label types the compare result table should include. Choose whether the compare result table should only list labels that differ for at least one dataset or should contain all labels to compare even if they do not differ. In case no "Ignore missing" option is active, missing labels will be regarded as difference and therefore shown. If at least one "Ignore missing" option is active, missing labels will not be regarded as a difference. This options does also influence the "Ignore missing..." behavior. In case the "Show only diffs" option is active, missing labels will be shown anyway and the “Ignore missing...” option is ignored. See “Show only missing / Ignore missing” for details. Choose whether the compare result table should only list labels that are missing in at least one dataset. Choose whether the compare result table should ignore labels that are missing in at least one dataset. So with this option being active only labels will be shown that exist in all datasets. However, if the option "Show only diffs" is active at the same time, labels that differ in at least one dataset are shown even if they are missing in other datasets. This options does also influence the "Show only diffs" behavior. In case no "Ignore missing" option is active, missing labels will be regarded as difference for "Show only diffs". If at least one "Ignore missing" option is active, missing labels will not be regarded as a difference. See “Show only missing / Ignore missing” for details. Choose whether the compare result table should ignore labels that are missing in the master dataset. So with this option being active only labels will be shown that exist in the master dataset. However, if the option "Show only diffs" is active at the same time, labels that differ in at least one dataset are shown even if they are missing in the master dataset. To show only a compare result for a reduced set of labels based on their names just type in lower case letters regardless of the case of the label name. The wildcard * can be used to match any characters. If the filter string starts with a / the expression will be evaluated as a regular expression. The active filter will be displayed in the table header of the master dataset. An active filter can be removed at once (Esc). To show only a compare result for a reduced set of labels based on their functions just type in upper case letters regardless of the case of the function name. No wildcards or regular expressions must be used. The active filter will be displayed in the table header of the master dataset. As long as the filter does not match a single function exactly it is colored red. Otherwise it is colored green. The comparison table will only show labels if the filter matched at least one function exactly. An active filter and can be removed at once (Esc). 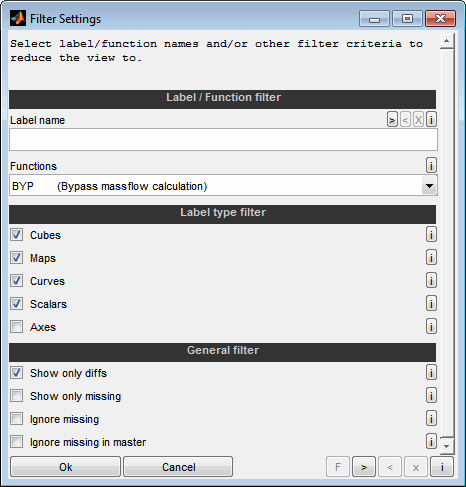 The function filter may also be set using a dialog (Ctrl + f). It can be defined which label types (maps, curves, scalars, axes) the compare result table should list. The label type filters may also be set using a dialog (Ctrl + f). It can be defined (Ctrl + d) whether the compare result table should only list labels that differ for at least one dataset or should contain all labels to compare even if they do not differ. This options does also influence the "Ignore missing..." behavior. In case the "Show only diffs" option is active, missing labels will be shown anyway and the “Ignore missing...” option is ignored. It can be defined (Ctrl + m, Ctrl + Shift + m) whether the compare result table should only list or ignore labels that are missing in at least one dataset. Additionally the option to ignore labels missing in master is available. This functionality can be used to quickly obtain an overview regarding missing and new labels or to remove missing labels from the comparison result. The font size of the comparison result table can be adjusted using the corresponding menu items or keyboard shortcuts (Ctrl + +, Ctrl + -). The values of the labels marked in the table can be shown in a comparative view (Ctrl + w, Double click). Depending on the type the label (map, curve, scalar, text) the presentation is chosen to be graphically or textually. It is also possible to force textual output (Ctrl + t). 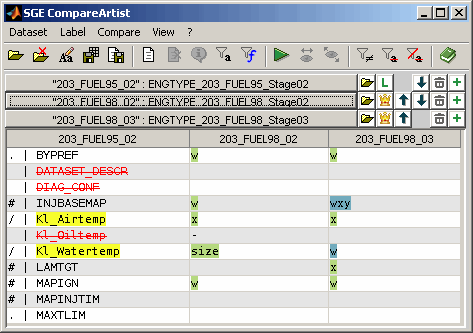 In this mode for each label marked in the table a separate representation of the comparison is shown. The representation will always contain the label of all datasets even if the label was only marked for one dataset. If a label is missing in a dataset or its type or size does not match the master it will be excluded. This special visualization mode (Ctrl + Shift + w) allows to compare labels e.g. with different label names. Different to the normal visualization the representation will not be done separately for the marked labels but combined. And also in contrast only the marked table cells will be considered. So not all datasets will be considered but only the marked ones. Depending on the type the label (map, curve, scalar, text) the presentation is chosen to be graphically or textually. It is also possible to force textual output (Ctrl + Shift + t). If a label is missing in a dataset or its type or size does not match the master it will be excluded. 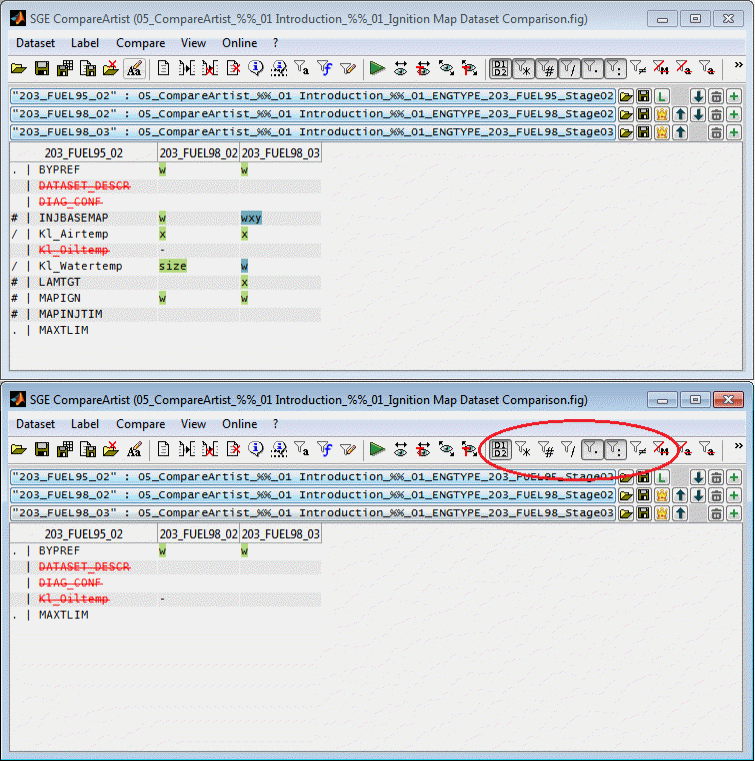 The online mode links typical actions with keyboard shortcuts that are active even when the CompareArtist is not in the foreground. This makes it easy to perform frequently used actions such as visualizing labels or adding them to an ETAS INCA experiment from anywhere. No matter where you work on your computer or with which software - copy the information to be used (=label names) into the clipboard and execute a key combination that is linked to an action in the CompareArtist. To activate the online mode use the corresponding menu / toolbar entry or the keyboard shortcut (Ctrl + F12). While the online mode is active it listens periodically for the configured keyboard shortcuts and clipboard content. The keyboard shortcuts and associated actions can be configured so that they do not overlap with the software you use to copy label names. Specify the interval of the online cycle and thus the frequency of keyboard shortcuts. By default, when a shortcuts is executed, the linked action is executed immediately and applied to the contents of the clipboard. If this action is active, the clipboard is displayed first and can be controlled and edited. As long as the text output window is remaining opened, new content gets appended at the end. Acticate this option to sort the output instead. As long as the text output window is remaining opened, new content gets appended at the end. Acticate this option to remove duplicate text output. So when the same labels are visualized multiple times with this option action only the most recent output is kept. 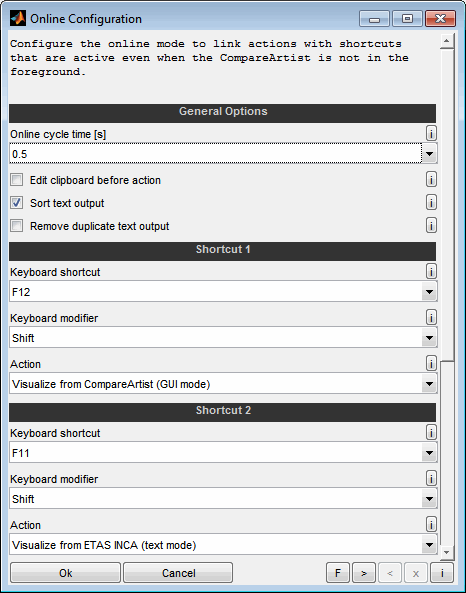 Configure the keyboard shortcut and modifiers that and the correlated actions. The following actions are available. This option ensures that you are asked which action to perform every time. The labels from the clipboard will be visualized in the standard graphical way for all datasets loaded in the CompareArtist. 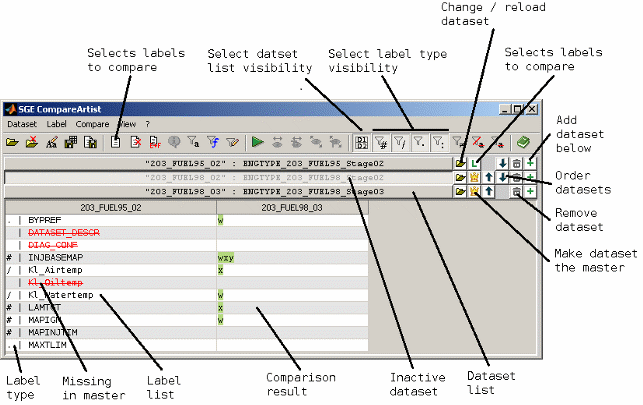 Therefore at least one dataset must be loaded and the comparison result table must be filled because the labels to visualize must be included in the table. The labels from the clipboard will be visualized in the standard graphical way for all datasets loaded in the CompareArtist in a common view to enable the comparison of different labels. Therefore at least one dataset must be loaded and the comparison result table must be filled because the labels to visualize must be included in the table. The labels from the clipboard will be visualized textually for all datasets loaded in the CompareArtist. Therefore at least one dataset must be loaded and the comparison result table must be filled because the labels to visualize must be included in the table. For the labels from the clipboard the CompareArtist elements info will be shown. Therefore at least one dataset must be loaded and the comparison result table must be filled because the labels to visualize must be included in the table. The info shown always origins from the master dataset. 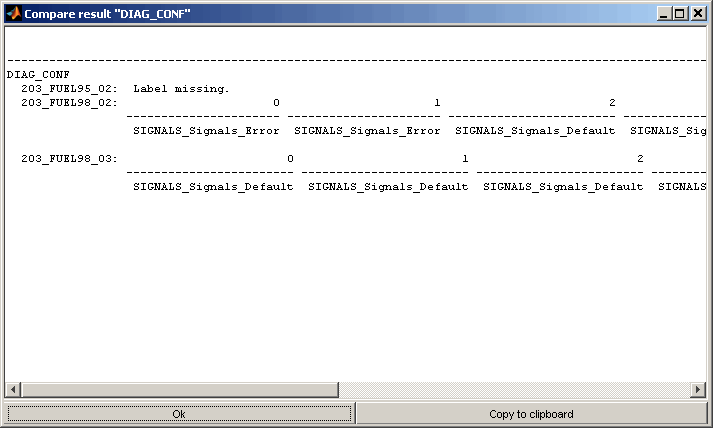 The labels from the clipboard will be visualized in the standard graphical way after retrieving its data from ETAS INCA software. The labels from the clipboard will be visualized textually after retrieving its data from ETAS INCA software. As long as the text output window remains open the new content will be appended. Use the corresponding options to keep the output sorted and/or unique. The labels from the clipboard will be added to the current ETAS INCA experiment. Session files can be opened the same way as dataset files or using the SGE Circus or SGE Viewer. Apart from saving a session it is possible to save datasets to files and transfer datasets to ETAS INCA software, see section “Save datasets“ for details.